This morning I dedicated my yoga practice to Susan Niebur, an amazing digital sister and #dsfierceliving shero who inspires me tremendously. After yoga, I wrote in my journal and discovered I was writing the dedication page for my book, Digital Sisterhood. Susan’s name appeared. Here’s why. 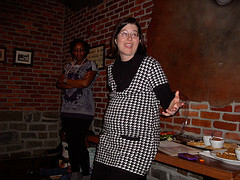 I heard Susan share her breast cancer journey at BlogHer in New York City in August 2010. Click here to watch a video of her talk. Her words moved my spirit. They made me think of my two grandmothers who lived with breast cancer. When I returned home from BlogHer, I started following her blog, Toddler Planet and became inspired by her fierce living spirit, heart, and courage. She quickly became one of my digital sister sheros. In January 2011, I met her in person at the Be Blogalicious movie event in Silver Spring, Maryland (photo above was taken of Susan at the event). That was a game changing moment because I had a chance to tell her how much I was inspired by her BlogHer talk and blog. In October 2011, I listened to Susan share her journey at the Blogalicious Conference held at the National Harbor in Maryland. Later in the day, I was able to hug her and say how much I appreciated her story and work. Susan made her transition on February 6. Her hug is now a priceless gift I will always treasure. Through Susan’s blog, I was able to witness the power of how one woman used social media to document and share her health journey, build community with like-minded people, give and receive support, and promote breast cancer awareness. She caused me to look for other women who were doing similar things with social media. I found plenty. These women along with Susan inspired me to dedicate Digital Sisterhood Month 2011 to women’s health. I am so grateful for the presence of Susan in my social media life. Her fierce spirit, heart, and courage will always be remembered. Today I am sending love and light to her husband, sons, family, and friends. She will be deeply missed. Visit her Toddler Planet blog to learn more about her amazing life and journey. PS: Join Digital Sisterhood Network on February 8 for a special #DigitalSisterhood Wednesday Twitter tribute to Susan. Follow @digitalsisterhd and check out the #dsfierceliving Pinterest board. Happy Last Day of March! I hope this month has been a good one for you and your family. 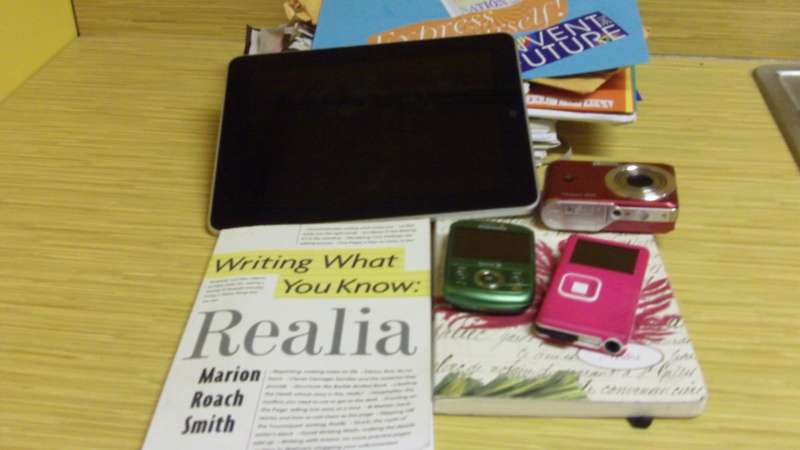 It’s been a wake up call for me and a time to get real about where I am in my writing process for my Digital Sisterhood book. This morning I made a video update on my writing process so you would know exactly what I have been doing since January and what I am planning to do in April. See the video below. What do you think about my writing process? It’s Digital Sisterhood Wednesday! What a great day for the launch of Digital Sisterhood Network’s second Kickstarter.com book fundraiser. The fundraiser supports the publication of my next book Digital Sisterhood, a memoir. The goal is $500 by June 28. As many of you know, my first Kickstarter.com fundraiser (September-December 2010) was extremely successful. With the support of 39 backers, I successfully raised $1,159 online and an additional $70 offline. The grand total was $1,229. I have $371 to raise in order to meet my long-term goal of $1,600. That’s why I have returned to Kickstarter with Digital Sisterhood – Part 2. Our $500 fundraising goal will cover the balance of the iUniverse, Inc. self-publishing, mailing, and photography expenses. Click here to listen to my audio blog about the fundraiser. Click here to learn more about the fundraiser and make a donation. PS: Please spread the word about the Digital Sisterhood Part 2 Kickstarter Book Fundraiser. Please use this link: http://kck.st/i15fwC.